It’s salad season, and one way to ensure the freshest, most colourful, salads ever is to grow your own vegetables. 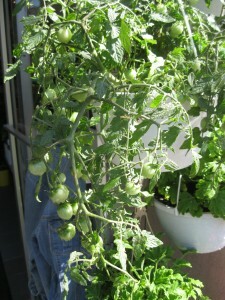 Obviously this isn’t easy to manage in a condo, but it is simple—and fun—to hang up, say, a basket of cherry tomatoes on your balcony and watch them ripen. There’s nothing better than to pluck the ripe tomatoes and toss them directly into the salad you’re making. Delicious!